St. Joseph’s Prep’s Chris Clover (no. 1) was named the Catholic League’s Most Valuable Player by league coaches. 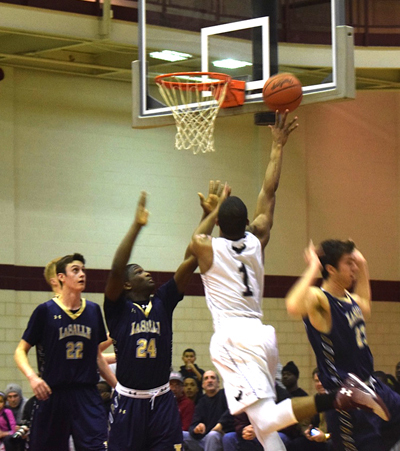 The coaches of the Philadelphia Catholic League have voted their first, second and third-team standouts for the 2014-2015 season in boys basketball. All players are seniors except where noted. Derrick Jones, Archbishop Carroll; Quade Green, Neumann-Goretti (sophomore); Lamarr Kimble, Neumann-Goretti; Tony Carr, Roman Catholic (junior); Luke Connaghan, Archbishop Wood; Steve Jordan, Conwell-Egan (junior); Najee Walls, La Salle; Gemil Holbrook, Roman Catholic; Shawn Witherspoon, La Salle. Dave Krmpotich, La Salle; Zane Martin, Neumann-Goretti (junior); Tom Funk, Archbishop Wood (junior); Josh Sharkey, Archbishop Carroll (junior); Nazeer Bostick, Roman Catholic (junior); David Beatty, Archbishop Carroll (sophomore); Izaiah Brockington, Archbishop Ryan (sophomore); Dhamir Cosby-Roundtree, Neumann-Goretti (sophomore); LaPri McCray-Pace, Conwell-Egan (junior); Marques Jackson, Bonner-Prendergast. Will Brazukas, Father Judge; Vinny Dalessandro, Conwell-Egan (junior); Jahmil Harris, West Catholic; James McGovern, St. Joseph’s Prep; Manny Taylor, Roman Catholic.